The major scale is a moveable scale that can be played in any key. The root note that you start the scale on determines which key you are playing in. Today’s lesson will focus on the A major scale, but it can be moved to fit into any key you’d like. 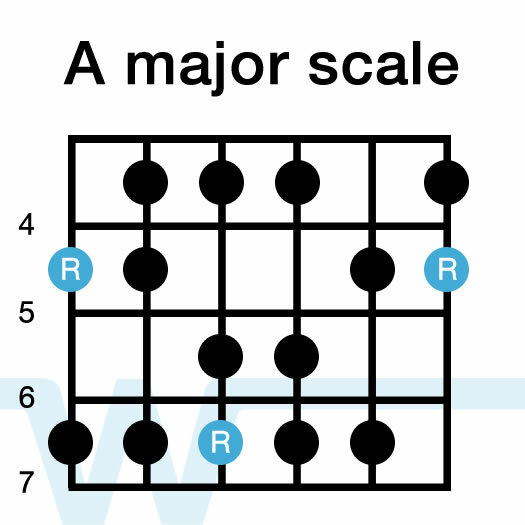 The first step in playing this scale is how you position your fingers. Each finger (one through four) stays on a fret and does not move side to side to different frets – only up and down to different strings. For this scale, your one (index) finger plays only on the fourth fret. Your second (middle) finger plays only the 5th fret, and so on. Start on the 5th fret, low E string with your 2nd finger, and follow the diagram above. The blue notes indicate the root note (A) of the key we are playing in (also A). Awesome this helps a lot. You explain things really well on this video. Is there a cheat sheet to see where we can move this scale to fit other keys? Say the key of C or Key of B.
Hi is this exercise also for electric guitar or oonly acoustic? It works on either kind of guitar – thanks! Is this exercise also for electric guitar or oonly acoustic? Can you specify on the intermediate advanced section if is applicable for elecric or just acoustic ?